Our regular look at some of the faces which have made the news this week. 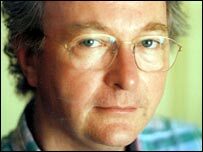 Above are Philip Pullman (main picture), with Diana Ross, Spalding Gray, Jason Leonard and George Michael. Atheist author Philip Pullman has this week received his CBE from the Queen, and heard the Archbishop of Canterbury hail his work as "a near-miraculous triumph". But while the children's author is being saluted from the highest echelons of the Anglican Church, to some he remains a figure of suspicion and controversy. The success of the His Dark Materials trilogy has propelled Philip Pullman onto the very highest platform of lucrative literature. Viewers of the BBC's Big Read recently voted his work the third most popular ever, after JRR Tolkien's and Jane Austen's and, with his ability to create whole new worlds, he has been called Tolkien's natural heir. 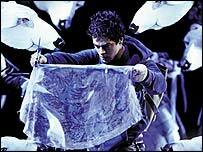 Pullman's grand tale of parallel universes, shape-shifting creatures and courageous endeavour has been adapted into a National Theatre production of equally epic proportions. Like JK Rowling, Pullman has discovered that creating magic for the little people can reap big rewards for his bank balance. The trilogy - Northern Lights, The Subtle Knife and The Amber Spyglass - has won numerous awards and been translated into more than 30 languages. Like Rowling, Pullman has found the success of his books lies in their appeal to a more mature readership. He doesn't hesitate to embrace expansive and disturbing themes of a universe thrown into disarray, the demise of an ultimate Authority, and the establishment of a "republic of heaven". He makes apparent his distaste for organised religion, explaining that "wherever you see priesthoods and power, you see tyranny and repression. It's almost a universal law". But these very adult ideas have created for Pullman a literary hot potato. The Archbishop of Canterbury, Dr Rowan Williams, accepts intelligent criticism of the church and this week called for His Dark Materials to form part of all pupils' religious education. On the other hand many traditional Christians, both in the UK and in the powerful Bible belt in the US, have tagged Pullman a heretic and a threat to world order. The Catholic Herald has called his work blasphemy and "fit for the bonfire". Pullman's view is that he is merely questioning the "tendency in human beings to excuse their behaviour by reference to some absolute". Certainly, his books contain many examples of courage and kindness being rewarded, fanaticism and cruelty punished. Also evident are details surely inspired by Pullman's own background. Like his protagonists Lyra and Will, the author experienced a nomadic, self-sufficient, childhood. Born in Norwich in 1946, he and his brother were raised mainly by their grandfather, while their parents remained glamorous but distant figures. Pullman was only seven when his father, an RAF pilot, was killed. His mother, a Chelsea-based socialite, soon married again and most of young Philip's affection was reserved for his step-father. When his step-father died two years ago, the author gave him a cracking send-off, having his ashes placed in rockets and fired into the sky above the river Firth of Forth. Before he turned to writing full-time, Pullman worked as a teacher, then lecturer. Long before the sale of his novels made him a wealthy man, he struggled for money, cycling to work in Oxford and living on school dinners. His responsibility for pupils' drama productions re-ignited a lifelong love of storytelling but, as he explains, "it took me 30 years to become an overnight success". This success shows no sign of abating. While what Pullman really craves is "dullness and routine - that's when I work best", his novels continue to fly off the shelves, tickets for the West End production change hands for up to £400 and church leaders debate the meaning of his words. For a best-selling author, there is surely no such thing as bad controversy, and Pullman appears able to take the theological enquiry in his stride. He says, "There is no doubt which side I am on, I am on the side of good. My only quarrel is with the fundamentalists who want to shut down debate." In the latest instalment of her drink-driving saga, Diana Ross was ordered back to jail. It transpired that, despite spending two nights in a Connecticut prison, she had somehow failed to serve the full 48 hours of her sentence. Ross was originally arrested in Arizona, and a Tucson judge this week re-called her to organise the completion of her term. More than a year after her offence, the troubled diva faces another day in court. Spalding Gray, whose body was found in New York's East River, made his living by telling monologues about his neuroses. While he did so hilariously, and could be cavalier with the facts, Gray really was haunted by personal demons, including his mother's suicide. In one of his stories, he imagined jumping from the Staten Island ferry and finding "the perfect moment". It seems his life may have ended in a quest for that moment. Jason Leonard, the world's most capped rugby union player, has decided to end his international career. The 35 year-old Harlequins and England forward played the first of his 114 Tests against Argentina in 1990, won four Grand Slams and was part of last year's World Cup triumph. Paying tribute to Leonard, the England coach, Sir Clive Woodward, added: "When Jason decides to retire from club rugby I would like him to consider a coaching role, hopefully at the RFU." After two decades of celebrity and the sale of 75 million records, George Michael has announced that his current album will be his last. The star is abandoning the music business, and will instead publish his songs for free on the internet. Since his split from Wham! in 1986, Michael's career has been a rollercoaster of stardom and stubble, acrimony and arrest, and he's decided to climb off the gravy train. His aim? To be "hopefully a happier man".